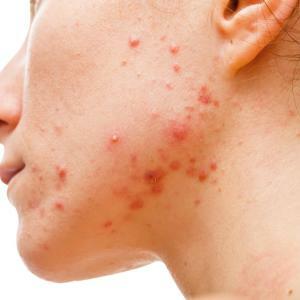 Acne vulgaris is a chronic inflammatory dermatosis which is notable for open and/or closed comedones (blackheads and whiteheads) and inflammatory lesions including papules, pustules or nodules. Mild acne has <20 comedones or <15 inflammatory lesions or <30 total lesion count. Moderate acne has 20-100 comedones or 15-20 inflammatory lesions or 30-125 total lesion count. Severe papules/pustules or nodulocystic acne is the acne resistant to topical treatment or if scarring/nodular lesions are present.